The impression that a frozen appetizer cannot have a gourmet taste or be made from the best in natural ingredients commonly held in the United State is being challenged by Savorly. Beloved French cookie company, Michel et Augustin, also known as The Troublemakers of Taste, unveiled an exclusive U.S. packaging re-design and a new flavor at this year’s Expo West. Hilary’s, a leading brand in the plant-based products industry, announced the launch of two enticing new higher protein veggie burger flavors: Grain-Free Super Cauliflower and Fiesta Black Bean. 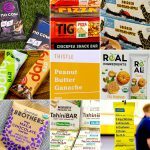 Last year CPG giant Mondelēz tasked its innovation and venture arm SnackFutures with the goal of generating $100 million dollars in growth by 2022. At Expo West 2019 NOSH Editor Carol Ortenberg sat down with SnackFutures’ head of innovation Brigette Wolf to discuss the group’s mandate and how it hopes to achieve that goal. Fourth & Heart, the California-based artisanal food brand known for its gourmet flavored ghees, previewed a brand new addition to its line-up of Ghee based products, and taking its first pivot step into a brand new category with its launch of WOKE Protein, Collagen & Energy Bars, at Natural Products Expo West. Wine RayZyn, a superfood snack company that creates healthy snacks from specially dried wine grapes, launched its newest product, CabernayZyn Truffles — a decadently delicious but guilt-free chocolate treat — at the 2019 Expo West in Anaheim, California. Shaka Tea, the first line of authentically Hawaiian iced teas on the market brewed from mamaki, announced on International Women’s Day at Expo West its expansion into the premium dried tea category, as well as a collaboration with contemporary, Native Hawaiian artist Nanea Lum. Path of Life, known for its plant-based gourmet quinoa and veggie blend side dishes, debuted its exciting new look at last week’s Natural Products Expo West. Birch Benders, the number one pancake and waffle mix brand in the natural channel and the fastest growing pancake brand in the conventional channel, has announced the launch of Magic Syrup, a first-to-market paleo-and keto-friendly syrup line.